With the 2014 Winter Olympic Opening Ceremonies starting this Friday, I thought it would be fun to make a dish symbolic of Russia. 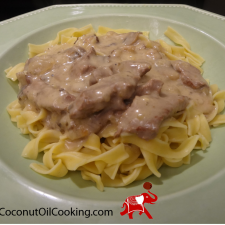 Looking through some of my dad’s old recipes, I came across one for beef stroganoff that will hit the spot. I tweaked this traditional favorite a little by using coconut oil instead of olive oil to sear the beef. A perfect meal to make in honor of the 2014 Winter Olympics! Coconut oil is used by some athletes during Olympic training, including Apolo Ohno. This champion has actually linked using coconut oil to fuel his body before his races. The medium chain triglycerides that are found in coconut oil are processed like a carbohydrate, giving your body an immediate energy source. This hearty dish will do the trick of keeping you full and satisfied and is also great for the next day – who doesn’t love leftovers?! Heat coconut oil in a large skillet on medium-high heat. Add beef strips, onions, and mushrooms. Sear ingredients until beef is no longer pink and vegetables sautéed. Next, stir in seasoning mix and 1 cup water. Mix well. Bring ingredients to a boil and cover. Reduce heat and simmer for 10 minutes, stirring occasionally. Add in sour cream and white wine; mix well. Let simmer for another 5 minutes and then remove from heat. 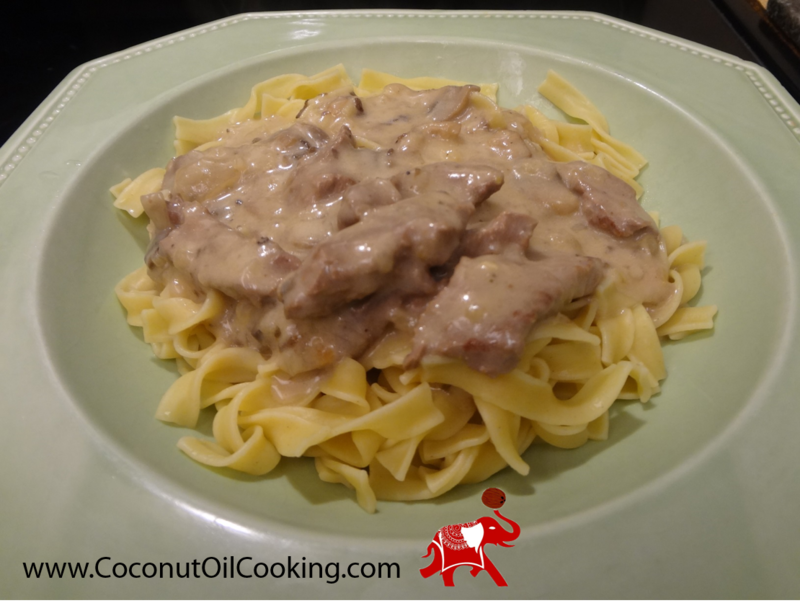 Using coconut oil in this recipe really brings out the flavors of the onions and mushrooms, complimenting the finished sauce perfectly. Since I can only eat so much of this dish, I love to freeze the any leftover sauce and save it for another time. This actually holds up well and tastes the same when defrosted.